$/£/€ 1000 Bonus GO HERE T&C Apply 18+. Insta Casino belongs to a great group of casinos with 5 other operators, all of them under the management of MT SecureTrade Limited. This is one of the best and most reputable groups of casinos in the industry today, as they are regulated by the Malta Gaming Authority, Curacao eGaming and the UK Gambling Commission. Their casino games have monthly audits performed by the top testing agencies in the world, GLi and eCOGRA. All withdrawals in the casino are usually processed under two hours, after the withdrawal request is approved. 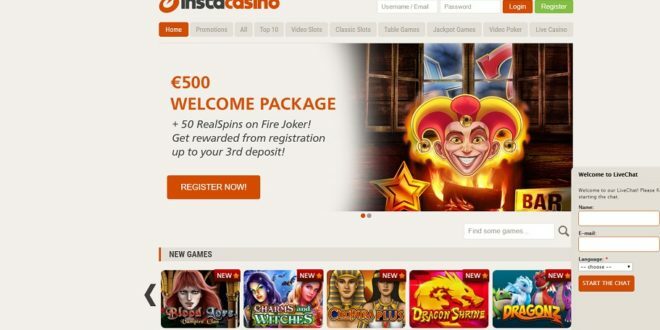 Insta casino is focused on providing players fast and easy access to the casino games, cutting down the time needed to make an account and start playing in minutes. This is why Insta casino offers full instant play and mobile access, while download is an unknown word for the casino management team. Players can choose between top of the line video slot games coming from NetEnt, Betsoft Gaming, Microgaming, Play N’ Go, NYX Gaming as well as live dealer games from Evolution Gaming. Video slot games are the driving force of Insta Casino. Players will find all of their favorite slot games here like Starburst, Dazzle Me, Dead or Alive, The Wish Master, 2 Million BC, Birds, Fruit Zen, Boomanji, Avalon II, Immortal Romance, Supe it Up, Thunderstruck II, Irish Eyes, Medusa and many more. They also have about 30 great Jackpot video slot games that can payout multimillion jackpot awards. Some of the most popular games in this category are: Mega Joker, Mega Moolah, Mega Fortune, Geisha Wonders, Major Millions, Mega Glam Life and more. As a top online casino operator, Insta casino offers a variety of Live Dealer games. They are powered by Evolution Gaming, who was the pioneer in this field and the best in the industry even today. Players will find every variant of Roulette, Texas Hol’em, Baccarat, Blackjack and Three card poker here at Insta casino. Following the latest trends in the industry and thriving to provide players unlimited access to the casino games, Insta casino has set up a fully functional mobile platform. This means that players can access all casino games on the go, from any of the most popular mobile operating systems like Android, Blackberry and iOS. No additional app needs to be downloaded as everything is launched directly from the mobile browser. The wagering requirements are set high with 40 x deposit + bonus for the first and 35 x deposit + bonus for the other two promotions. Still what’s great in this bonus offer is that real cash is played first. This means if you manage to build your balance without dropping down to the bonus funds, you can cancel the bonus and withdraw your winnings. Also another great fact is that the real spins are wager free and the winnings are added to your cash balance. Players can make deposits and withdrawals in Insta casino by using some of the most popular payment methods like Credit or Debit Cards, Skrill and Neteller. The withdrawal timeframe depends on the payment method, so E-wallet withdrawals are usually processed under 2 hours, while Card withdrawals take from 3 to 5 business days for the funds to arrive. In the short time since Insta casino came online they managed to build a great database of loyal daily players. The great offer of various casino games, attractive bonus promotions and fast payouts are reason enough for many players to make Insta casino their favorite online casino operator. You are welcome to make a real money account at Insta casino and take advantage of the great promotions they have to offer.